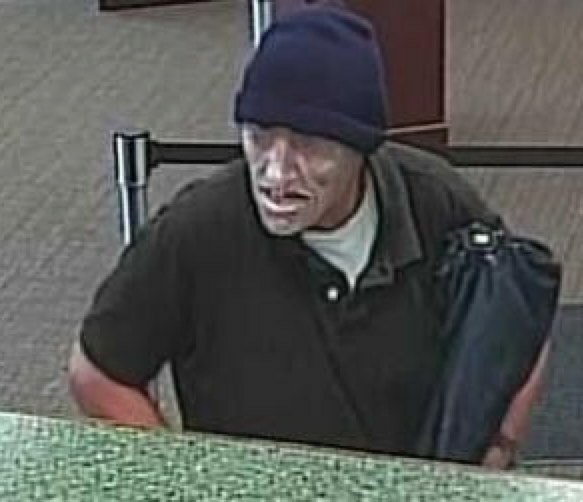 The FBI has released an image of a bank robber who struck in Lincoln Square over the weekend. The U.S. Bank at 4725 North Western was targeted in a “takeover” bank robbery just before 1 p.m. on Saturday, the agency said. The robber seen here displayed a handgun and demanded cash, but further details of the crime were not released. Unlike passive “note job” bank robberies in which robbers pass written demands to tellers, “takeover” robberies usually involve actions such as ordering people to the floor, threatening people verbally, and physical harm. No one was reported injured in Saturday’s hold-up, according to Chicago police. Witnesses told police that the offender wore a clear, light blue clown mask. He appeared to be white or Hispanic, about 5’9” tall and thin. He wore a blue hat, black polo shirt, black jogging pants, and carried a black umbrella. The suspect may have some skin discoloration around his mouth. He was last seen heading southbound on Western.